Background: Head-and-neck squamous cell carcinoma (HNSCC) is the sixth most prevalent type of cancers in the world. Due to its relatively high rate of recurrence, the prognosis of patients is poor and the survival rate is low; therefore, identifying the prognostic factors is considered necessary for better treatment. Materials and Methods: This historical cohort study was conducted on 201 patients diagnosed with aerodigestive SCC who underwent surgery and lymph node dissection. We determined the prognostic value of lymph node ratio (LNR) on overall survival (OS), disease-free survival (DFS), and locoregional failure-free survival (LFFS). 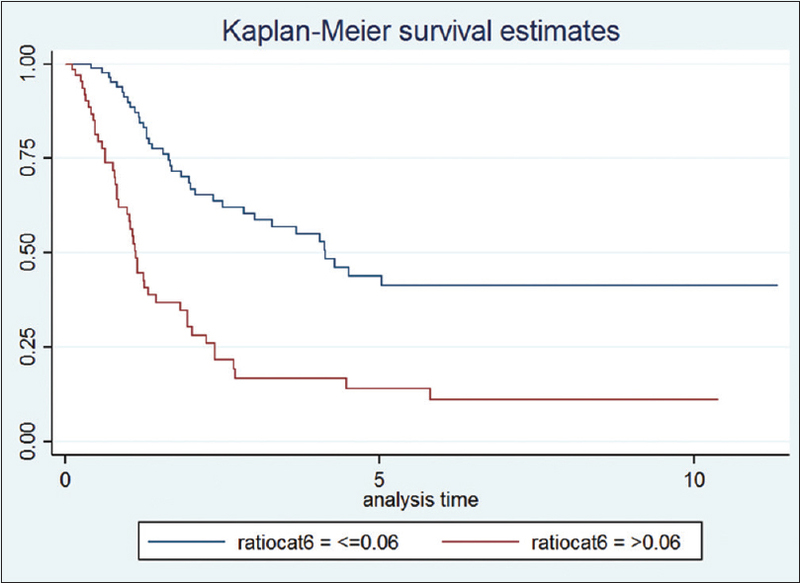 We noticed an association between LNR and survival by Kaplan–Meier analysis. Hazard ratio (HR) of LNR was determined by Cox's regression model. Results: Two hundred and one patients entered this study after their medical histories were evaluated. The mean of lymph node count and LNR was 14.30 (±9.50) and 0.12 (±0.23), respectively. Eighty patients (39.80%) experienced recurrence of SCC. Five-year OS, DFS, and LFFS were 32%, 21%, and 64%, respectively. The median of OS was 40.70 months and 30.11 months in patients with LNR of ≤0.06 and >0.06, respectively (P < 0.01). The LNR >0.06 was found to be a significant prognostic factor for lower OS of patients with HNSCC (HR = 2.11 [1.10, 4.40]; P = 0.04). DFS was not significantly different among patients with LNR ≤0.06 and patients with LNR >0.06 (P = 0.9). However, LFFS was slightly different among two groups (HR = 2.04 [0.90–4.80]; P < 0.1). Conclusion: We recommend more intensive adjuvant therapies such as chemotherapy with radiotherapy and short interval follow-up for patients with LNR >0.06. Further investigations with larger sample sizes are recommended. Head-and-neck cancers comprise approximately 4% of all cancers in the United States. These cancers which diagnosed over 50 years, are twice common in men rather than women. The most common type of head-and-neck cancer is squamous cell carcinoma (SCC) and they arise more commonly from oral cavity, oropharynx, larynx, and hypopharynx. Treatment strategies of head-and-neck squamous cell carcinoma (HNSCC) depends on tumor site and stage and patient-specific factors such as comorbidities and preference. Multimodality treatments of HNSCC can include surgery, radiation therapy (RT), chemotherapy, targeted therapy, or a combination of treatments. Patients with localized (Stage I and II) HNSCC are usually managed with either surgery or RT alone. However, patients with more advanced (Stage III and IVa/b) disease generally require various combinations of RT, surgery, and chemotherapy or cetuximab. Risk stratification is crucial in choosing the appropriate treatment and the need for adjuvant therapy. Currently, tumor, node, and metastasis (TNM) staging system is used for the determination of risk and prognosis of HNSCC. Nodal staging in this system is based on the following parameters: number, site, and size of positive lymph nodes., Recent evidence suggests that besides these factors, the number of positive nodes, lymph node ratio (LNR), and lymph node yield are critical prognostic factors that have not included in the TNM staging system. Several studies have revealed that LNR has great prognostic value in different cancers such as head-and-neck cancer, bladder cancer, esophageal cancer, and cervical cancer., LNR is defined as the ratio of the number of affected lymph nodes to the total number of excised lymph nodes. The aim of the present study was to evaluate the prognostic value of LNR in survival of HNSCC patients. All patients diagnosed with pathologically approved aerodigestive SCC and lymph node metastasis in neck dissection according to the pathologic report who were admitted to Tehran Cancer Institute (Tehran University of Medical Sciences, Tehran, Iran) between 2005 and 2011 were the candidates for participating in this historical cohort study. Patients with previous surgical intervention in head-and-neck region, noncomplete preoperative staging, distant metastasis, nonradical tumor resection, margin involvement, inappropriate neck lymph node dissection, and preoperative chemo- and radio-therapy were excluded from the study. All medical records of participants were surveyed; demographic data, histologic grade and stage of tumor, place of involvement, lymph node count, and LNR were collected from the medical records. Moreover, information surrounding the recurrence, site of recurrence, and survival was obtained by contacting the patients and/or their family member(s) and arranging a tele-interview. The data were analyzed using SPSS v. 20 software for Windows (SPSS Inc., Chicago, IL, USA). Quantitative data were presented as mean ± standard deviation (or median as appropriate) while qualitative data as frequency (percentage). Continuous data were compared among groups using independent samples t-test and categorical ones using Chi-square test. 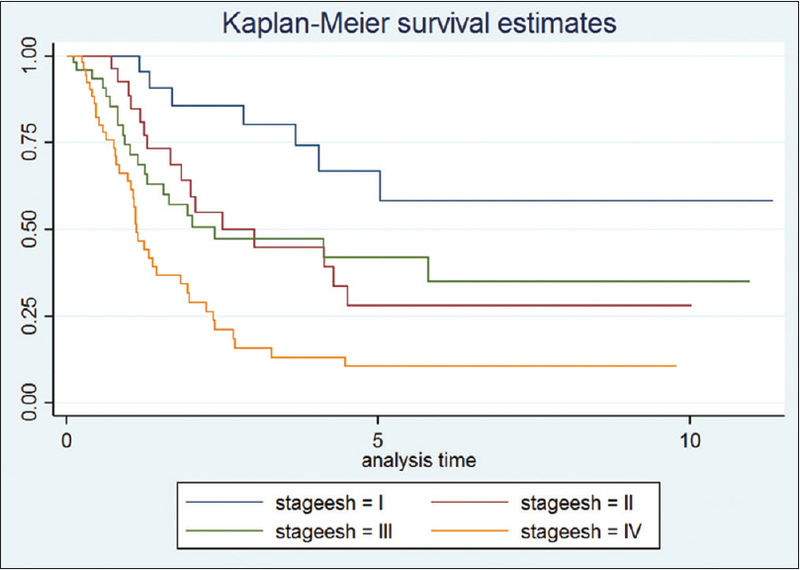 Kaplan–Meier method along with log-rank test were used to compare the overall loco-regional failure and disease-free survival (DFS) among two groups of patients with LNR of ≤ 0.06 and > 0.06 for different stages of cancer. Crude and multivariable adjusted hazard ratio (HR) were calculated using Cox proportional hazard regression to evaluate the potential impact of LNR on overall survival (OS), DFS, and loco-regional failure-free survival (LFFS). We considered cut point of 0.06 for LNR, similar to the study conducted by Gil et al. in 2009. All reported P values were two-sided. Our study was conducted according to the Helsinki Declaration. Furthermore, the study protocol was approved by the Research Ethics Committee of Tehran University of Medical Sciences (IR. Tums.vcr.rec. 1396.2831). Two hundred and one patients entered this study after their medical histories were evaluated. Eighty-nine patients (44.28%) were female and the remaining individuals were male. Thirty-eight patients (18.91%) were in the age group of <50 years, 74 (36.82%) in 50–70 years, 75 (37.31%) in >70 years, and 14 (6.97%) with unknown age due to the incompetency of patients' records. 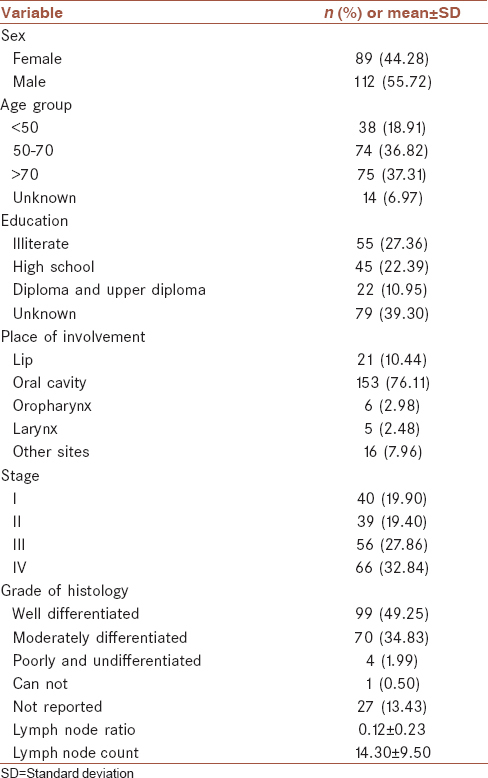 Sites of involvement were lips in 21 (10.44%), oral cavity in 153 (76.11%), oropharynx in 6 (2.98%), larynx in 5 (2.48%), and other sites in 16 (7. 96%) patients. Forty patients were in Stage 1 (19.90%), 39 (19.40%) in Stage 2, 56 (27.86%) in Stage 3, and 66 (32.84%) in Stage 4a and 4b. Grade of histology of 99 patients (49.25%), 70 (34.83%), 4 (1.99%), 1 (0.50%), and 27 (13.43%) were well differentiated, moderately differentiated, poorly undifferentiated, and unclear, respectively. The mean of lymph node count and LNR was 14.30 (±9.50) and 0.12 (±0.23), respectively [Table 1]. The total recurrence count was 80 (39.80%) in participants of this study, 7 (8.75%), 65 (81.25%) and 8 (10%) of which were local, regional, and distant metastasis, respectively. Five-year OS, DFS, and LFFS were 32%, 21%, and 64%, with a median of 30.11, 69.42, and 22.44 months, respectively [Table 2]. [Table 3] presents the 1-year, 3-year and 5-year OSs in two groups of patients with LNR of ≤0.06 and >0.06. Two groups of patients were significantly different in terms of types of survival rate (P< 0.01). The 5-year OS according to LNR was 44% and 14% with a median of 40.70 and 30.11 in patients with LNR of ≤0.06 and >0.06, respectively. The results of Kaplan–Meier and log-rank test for comparing the OS among patients with LNR ≤0.06 and LNR >0.06 indicated a significant difference (P ≤ 0.001). In addition, a significant difference was observed among patients in different stages of disease (P< 0.05). The observed differences were related to patients in Stage 4 compared to those in Stage 1 (P< 0.001), patients in Stage 4 compared to those in Stages 2 and 3 (P< 0.01), and patients in Stage 1 compared to those in Stages 2 and 3 (P< 0.05). However, no significant difference was found between patients in Stages 2 and 3. [Figure 1] and [Figure 2]. [Table 4] presents the crude and multivariable adjusted HR of potential impact of LNR on all studied types of survival. The LNR not only in crude model was a significant prognostic factor (3.20 [2.05, 4.95]) but also after adjustment for the impacts of potential confounding factor for OS of patients with HNSCC (HR = 2.11, 95% confidence interval [CI] (1.10, 4.40)). Although there was a significant relation between LNR, DFS, and LFFS in crude models, the DFS was not significantly different between patients with LNR ≤0.06 and patients with LNR >0.06 in adjusted model (HR = 1.01, 95% CI: 0.6–1.72, P = 0.9), while LFFS was slightly different between two groups (HR = 2.04, 95% CI: 0.90–4.80, P = 0.09). The present study was designed to evaluate the prognostic value of LNR in survival of HNSCC. The findings suggest that the OS among patients with LNR ≤ 0.06 and LNR > 0.06 has a significant difference (P ≤ 0.001). Furthermore, a significant difference was observed in LNR among patients in different stages of disease (P< 0.05). Due to high mortality and recurrence rate in HNSCC and also intensive treatments including surgery, chemotherapy, and radiotherapy, determining a major prognostic factor for patients seems to be necessary., Many factors have been considered as prognostic factor for patients with this type of cancer in studies conducted before such as TNM staging, age, gender, place of involvement, lymphovascular invasion, perineural invasion, lymph node involvement, and extracapsular invasion of metastatic lymph node., In 2015, Chen et al. emphasized the importance of LNR as a prognostic factor in head-and-neck cancer patients that affect OS and LFFS. Gil et al. in 2009 conducted a study on 386 patients with oral cavity cancer who underwent surgical treatment with or without adjuvant therapy and concluded that LNR (cut point of 0.06) is an independent prognostic factor in survival of patients. Reinisch et al. in 2014 revealed that LNR (cut point of 0.06) was a significant predictor of OS and recurrence-free survival. Lanzer et al. similarly mentioned that LNR and capsule penetration were independent prognostic factors in HNSCC. In contrast, the study by Roberts et al. indicated that the number of positive nodes is a better prognostic factor than LNR and American Joint Committee on Cancer N staging. In addition, de Ridder et al. concluded that due to changes in specimen processing, the number of positive lymph node is more reliable factor than LNR. However, it was later shown by Feng et al. that the combination of LNR and positive lymph node is superior predictor than traditional TNM staging for the benefits of adjuvant concurrent chemo-radiotherapy. Yong-Hong et al., who conducted a study on patients with SCC of hypopharynx, represented the LNR as a prognostic factor with cut point of 0.1. However, Feng et al. choose 0.075 as cutoff value, so different cut points for LNR were reported in the studies carried out in this field., We perused the effect of LNR on prognosis of patients with cut point of 0.06 and the LNR was a significant prognostic factor for OS. 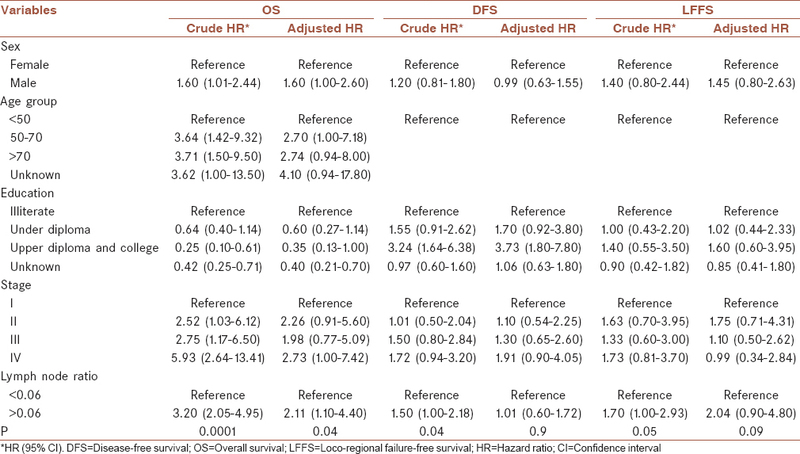 According to our study, the LNR is one of the significant prognostic factors for OS of patients, but not for DFS and LFFS in the period of follow-up (albeit the association because of HR >1). Shrime et al. allocated patients with oral cavity SCC in three groups by survival and count of involved lymph node. In this study, the authors concluded that the LNR had a significant negative effect on survival. In several studies, the number of positive lymph node or LNR was surveyed for determining its effect on survival of patients and each study reported various cut points., There were many confounding factors in these studies for determination of cut points, for example, the presence of previous chemo-radiotherapy. Hence, in this study to neutralize the effect of previous chemo-radiotherapy, we excluded all patients with history of chemo-radiotherapy. One of the problems we encountered was the incomplete medical records. From the other limitations, we can mention poor cooperation of some participants for follow-up. We conclude that the LNR is a significant prognostic factor in OS of patients diagnosed with HNSCC. We recommend more intensive adjuvant therapy such as chemotherapy with radiotherapy and short interval follow-up for patients with LNR >0.06. This study was supported by Tehran University of Medical Sciences, Tehran, Iran. We would like to thank all patients who cooperated with us while performing the present research. American Cancer Society. Cancer facts and figures 2017. Genes Dev 2017;21:2525-38. Fitzmaurice C, Allen C, Barber RM, Barregard L, Bhutta ZA, Brenner H, et al. Global, regional, and national cancer incidence, mortality, years of life lost, years lived with disability, and disability-adjusted life-years for 32 cancer groups, 1990 to 2015: a systematic analysis for the global burden of disease study. JAMA oncology. 2017;3:524-48. Pai SI, Westra WH. Molecular pathology of head and neck cancer: Implications for diagnosis, prognosis, and treatment. Annu Rev Pathol 2009;4:49-70. Marur S, Forastiere AA. Head and neck squamous cell carcinoma: Update on epidemiology, diagnosis, and treatment. Mayo Clin Proc 2016;91:386-96. Price KA, Cohen EE. Current treatment options for metastatic head and neck cancer. Curr Treat Options Oncol 2012;13:35-46. Machiels JP, Lambrecht M, Hanin FX, Duprez T, Gregoire V, Schmitz S, et al. Advances in the management of squamous cell carcinoma of the head and neck. F1000Prime Rep 2014;6:44. Feng Z, Xu QS, Wang C, Li JZ, Mao MH, Li H, et al. Lymph node ratio is associated with adverse clinicopathological features and is a crucial nodal parameter for oral and oropharyngeal cancer. Sci Rep 2017;7:6708. Lydiatt WM, Patel SG, O'Sullivan B, Brandwein MS, Ridge JA, Migliacci JC, et al. Head and neck cancers-major changes in the American Joint Committee on cancer eighth edition cancer staging manual. CA Cancer J Clin 2017;67:122-37. Gődény M. Prognostic factors in advanced pharyngeal and oral cavity cancer; significance of multimodality imaging in terms of 7th edition of TNM. Cancer Imaging 2014;14:15. Liao CT, Hsueh C, Lee LY, Lin CY, Fan KH, Wang HM, et al. Neck dissection field and lymph node density predict prognosis in patients with oral cavity cancer and pathological node metastases treated with adjuvant therapy. Oral Oncol 2012;48:329-36. Chen CC, Lin JC, Chen KW. Lymph node ratio as a prognostic factor in head and neck cancer patients. Radiat Oncol 2015;10:181. Herr HW. The concept of lymph node density – Is it ready for clinical practice? J Urol 2007;177:1273-5. Ooki A, Yamashita K, Kobayashi N, Katada N, Sakuramoto S, Kikuchi S, et al. Lymph node metastasis density and growth pattern as independent prognostic factors in advanced esophageal squamous cell carcinoma. World J Surg 2007;31:2184-91. Calcagno C, Lobatto ME, Robson PM, Millon A. HHS public access. Diagn Microbiol Infect Dis 2016;28:1304-14. Polterauer S, Hefler L, Seebacher V, Rahhal J, Tempfer C, Horvat R, et al. The impact of lymph node density on survival of cervical cancer patients. Br J Cancer 2010;103:613-6. Jacobi C, Rauch J, Hagemann J, Lautz T, Reiter M, Baumeister P. Prognostic value of the lymph node ratio in oropharyngeal carcinoma stratified for HPV-status. Eur Arch Otorhinolaryngol. 2017:1-0. Wang B, Zhang S, Yue K, Wang XD. The recurrence and survival of oral squamous cell carcinoma: A report of 275 cases. Chin J Cancer 2013;32:614-8. Cadoni G, Giraldi L, Petrelli L, Pandolfini M, Giuliani M, Paludetti G, et al. Prognostic factors in head and neck cancer: A 10-year retrospective analysis in a single-institution in Italy. Acta Otorhinolaryngol Ital 2017;37:458-66. Axelsson L, Nyman J, Haugen-Cange H, Bove M, Johansson L, De Lara S, et al. Prognostic factors for head and neck cancer of unknown primary including the impact of human papilloma virus infection. J Otolaryngol Head Neck Surg 2017;46:45. Mamelle G, Pampurik J, Luboinski B, Lancar R, Lusinchi A, Bosq J, et al. Lymph node prognostic factors in head and neck squamous cell carcinomas. Am J Surg 1994;168:494-8. Roberts TJ, Colevas AD, Hara W, Holsinger FC, Oakley-Girvan I, Divi V, et al. Number of positive nodes is superior to the lymph node ratio and American Joint Committee on Cancer N staging for the prognosis of surgically treated head and neck squamous cell carcinomas. Cancer 2016;122:1388-97. Chow TL, Kwan WW, Fung SC, Ho LI. Prognostic value of lymph node density in buccal squamous cell carcinoma. Am J Otolaryngol 2017;38:529-32. Wang YL, Feng SH, Zhu J, Zhu GP, Li DS, Wang Y, et al. Impact of lymph node ratio on the survival of patients with hypopharyngeal squamous cell carcinoma: A population-based analysis. PLoS One 2013;8:e56613. Sayed SI, Sharma S, Rane P, Vaishampayan S, Talole S, Chaturvedi P, et al. Can metastatic lymph node ratio (LNR) predict survival in oral cavity cancer patients? J Surg Oncol 2013;108:256-63. Xing Y, Zhang J, Lin H, Gold KA, Sturgis EM, Garden AS, et al. Relation between the level of lymph node metastasis and survival in locally advanced head and neck squamous cell carcinoma. Cancer 2016;122:534-45. Ema A, Yamashita K, Sakuramoto S, Wang G, Mieno H, Nemoto M, et al. Lymph node ratio is a critical prognostic predictor in gastric cancer treated with S-1 chemotherapy. Gastric Cancer 2014;17:67-75. Xiao XS, Tang HL, Xie XH, Li LS, Kong YN, Wu MQ, et al. Metastatic axillary lymph node ratio (LNR) is prognostically superior to pN staging in patients with breast cancer – Results for 804 Chinese patients from a single institution. Asian Pac J Cancer Prev 2013;14:5219-23. Amri R, Klos CL, Bordeianou L, Berger DL. The prognostic value of lymph node ratio in colon cancer is independent of resection length. Am J Surg 2016;212:251-7. Gil Z, Carlson DL, Boyle JO, Kraus DH, Shah JP, Shaha AR, et al. Lymph node density is a significant predictor of outcome in patients with oral cancer. Cancer 2009;115:5700-10. Reinisch S, Kruse A, Bredell M, Lübbers HT, Gander T, Lanzer M, et al. Is lymph-node ratio a superior predictor than lymph node status for recurrence-free and overall survival in patients with head and neck squamous cell carcinoma? Ann Surg Oncol 2014;21:1912-8. Lanzer M, Kruse A, Lubbers HT, Zemann W, Reinisch S. Lymph node ratio and capsule penetration as independent risk factors in head and neck squamous cell carcinoma. Head Neck Oncol 2012;4:1-8.
de Ridder M, Marres CC, Smeele LE, van den Brekel MW, Hauptmann M, Balm AJ, et al. Acritical evaluation of lymph node ratio in head and neck cancer. Virchows Arch 2016;469:635-41. Yong-Hong HQ, Yong-Feng P, Qiu Tang ZF. Effect of number and ratio of positive lymph nodes in hypopharyngeal cancer. Head Neck 2014;36:1391. Shrime MG, Bachar G, Lea J, Volling C, Ma C, Gullane PJ, et al. Nodal ratio as an independent predictor of survival in squamous cell carcinoma of the oral cavity. Head Neck 2009;31:1482-8.